Blues & BBQ at your fingertips. The Roots N Blues N BBQ Festival is an annual event held in Columbia, Missouri. It’s attended by 30,000 people looking for a weekend of soulful food and music. In 2013, organizers of The Roots N Blues N BBQ Festival approached us about redesigning their website. Organizers wanted a website that showcased the festival and allowed for easy dissemination of information-- such as ticket sales. It was also important that the website stood out from other music festivals. 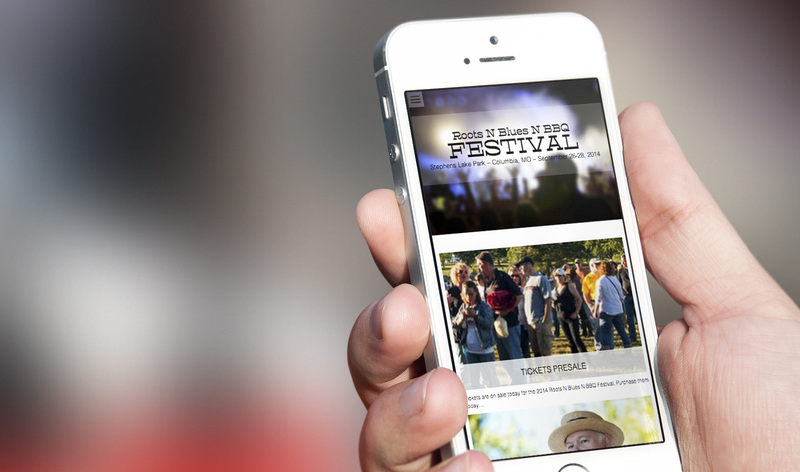 We decided to turn The Roots N Blues N BBQ Festival’s old website into a responsive website. It features a complex, single page design that allows the user to find all the information they need on one page. Additionally, we designed this website so that it works on all devices. This is especially important come festival time. Attendees can easily find music and food locations on their mobile devices. For 2014, we have taken The Roots N Blues N BBQ Festival website one step further. We launched a new Wordpress powered website that is fully responsive. This new site uses large imagery with clean design lines and flat style. We were able to accomplish this utilizing HTML5, CSS3, Wordpress and responsive web design. No matter your business, organization or event, it’s important you are able to clearly and properly tell your story. Now more than ever, that means reaching your audience on multiple platforms. We have experience designing responsive websites and are dedicated to helping you tell your story. Our goal is helping you find focus. At Hub & Spoke, we tell true stories, online + offline. Contact us today to schedule a meeting or just to talk.